Learn to speak Spanish on your own schedule and at your own pace. 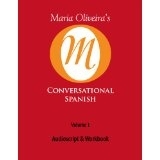 For independent self-study, or in conjunction with ongoing classwork, Maria’s Spanish books and CDs offer lessons from beginning to advanced levels. Spanish 1, 2, and Conversational Spanish all provide the basics, including vocabulary, essential sentence building, and grammar. Other offerings are designed for specific subjects, such as career-specific needs, for socializing, working with gardeners, for law enforcement, and more! Many Spanish language students find these lessons to be a great opportunity for learning new words and useful expressions as they seek fluency. 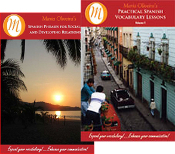 Shop this page, and discover fun, convenient, accent-perfect, portable Spanish lessons!